Stomach cancer. Coloured X-ray of the stomach of a 58-year-old patient with stomach cancer. A malignant (cancerous) tumour is seen at centre left. 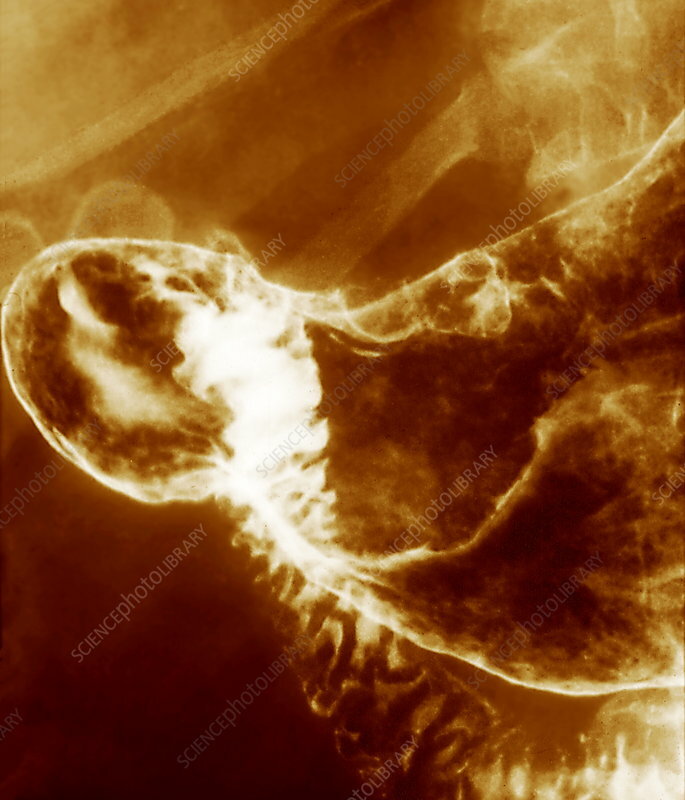 Stomach cancer is most common in men over 55. This is an adenocarcinoma, the most common type of stomach cancer. The cancer has arisen from the glandular cells in the stomach lining that produce mucus and gastric juices. The main risk factors for stomach cancer are a diet high in salt, infection with the bacteria Helicobacter pylori, and smoking. Symptoms include indigestion, pain, difficulty swallowing and nausea or vomiting. Treatment is with surgery to remove the tumour or relieve symptoms, combined with chemotherapy.